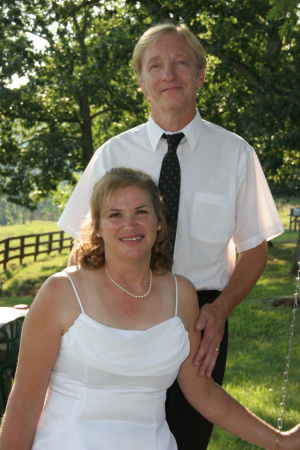 A celebration of the union of John "Paul" Peterson and Glenna Joy Cummins took place at Mountain View Fellowship Church on July 8, 2006 in Amherst, VA. Pastor Charles Olivieri officiated the ceremony. The bride was given in marriage by her uncle, Mr. Marvin Cummins of Bristol, Tenn. The matron of honor was Mrs. Kay Olivieri of Fredericksburg, VA. Mr. Ely Grimes of Bowling Green, VA. served as the best man. A reception was held under the church veranda amidst the cool breezes of the beautiful setting of Smyrna, VA. The couple met while serving as missionaries in Tanzania. Mr. Peterson is sponsored by Promised Land Praise and Worship Center of Fredericksburg and Mt. View Fellowship of Amherst. He serves as Pastor, Evangelist, and is a Teacher of Theology to the area ministers. After a honeymoon trip in Canada and Williamsburg, Virginia, the couple returned to Tanzania on July 16. Friends there will be holding a third celebration of their union in the "local" style. John and Glenna were united in marriage July 1, 2006 in Toronto, Canada. Godspeed to them as they journey to Kenya and other destinations to minister to the needs of others.